The School of Medicine announced that Steven D. Waldman, M.D., JD, has been appointed vice dean for strategic initiatives and stewardship. In this role, he will be involved in all initiatives with a major strategic importance to the School of Medicine. The appointment, announced by School of Medicine Interim Dean Mary Anne Jackson, M.D., took effect on April 15. Waldman is a 1977 graduate of the School of Medicine. His roles will include developing new strategies for increasing student enrollment and furthering collaborations with regional partners. He will also coordinate new innovative infrastructure projects within the school. As physician liaison to the UMKC Foundation, he will facilitate closer relationships with School of Medicine alumni and increase opportunities to enhance UMKC branding and fundraising in surrounding areas. He will also serve as the School of Medicine partner to the newly appointed president of the UMKC Foundation. “All of these functions will serve to elevate the academic reputation of the medical school,” Jackson said. Waldman previously served as associate dean and chair of the Department of Medical Humanities and Bioethics and professor of anesthesiology. He was also part of an integral team that led the school’s preparation for a successful 2018 LCME survey visit. A prolific writer and author of more than 36 books and numerous scientific publications, he will continue to maintain his clinical practice in pain management. The warm weather is here – and the UMKC Health Sciences District has a number of upcoming healthy initiatives for staff, students and faculty. Whether it’s an e-bike rental or a walking group, the District is working to get everyone active and outdoors. The Health Sciences District Run/Walk club has begun again this year. Each weekday over the lunch hour, you can join fellow students, faculty, staff and friends from throughout the district to run or walk the 2.5-mile route. If you’re interested in participating, the group meets at 24th St. and Charlotte – just look for the Run/Walk sign. New this year: the group is putting together a team to participate in the Hospital Hill Run. Unlike past year’s, this year’s race will take place on Saturday, June 1. 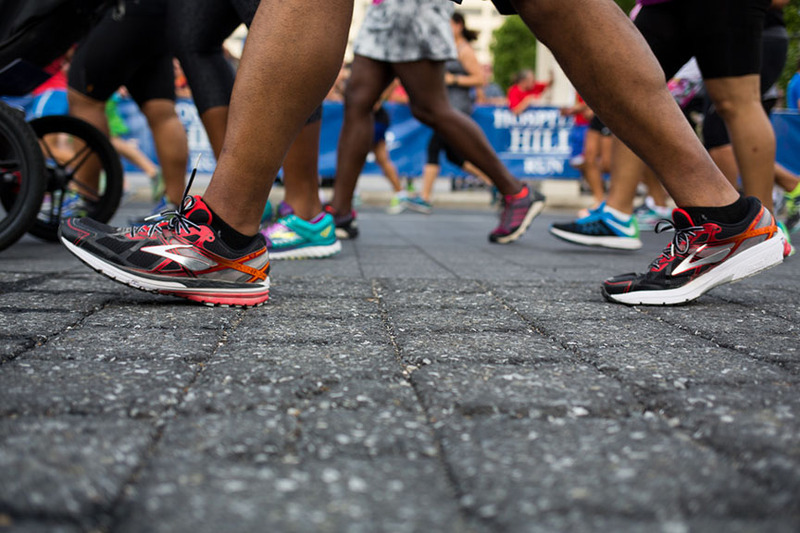 The starting and finishing lines for all three race distances – 5K, 10K, and half marathon – will be set up at Kansas City’s Crown Center. All UMKC running enthusiasts, faculty, staff, students and alumni, may receive a 20 percent discount on registration. To sign up for any of the day’s races, use the code UMKCDISC19. Register at hospitalhillrun.com. If you’re not participating as a runner but would still like to get involved, the event is looking for volunteers. Contact Alison Troutwine at alison.troutwine@tmcmed.org for more information. On April 24, the District will be host to a free pop-up yoga class. Start time is at 5:15 pm. The class will be held outdoors in the green amphitheater space on the NE Corner of 25th St. and Holmes Rd. All registered participants will be entered to win a free yoga mat and a gift card from Ruby Jean’s Juicery. If interested, bring your own mat and register at umkchealthsciencesdistrict.org. And if you need help getting around to all these fun activities, the District has you covered. RideKC Bike has released a new fleet of smart, electric-assisted bikes housed in the district for bike share users. They are already available just outside the UMKC Health Sciences Bookstore, and you can start or end your trip at any RideKC Bike hub around the city. To. Get started, download the Drop Mobility app to find bikes and hub locations near you. Your first ride is free. The district is committed to encouraging a healthy lifestyle throughout our District community. It’s a perfect time to enjoy this beautiful weather and take advantage of these great offerings. Brian Carter, M.D., delivered the 2019 William T. Sirridge, M.D., Medical Humanities Lectureship at the School of Medicine on March 28. 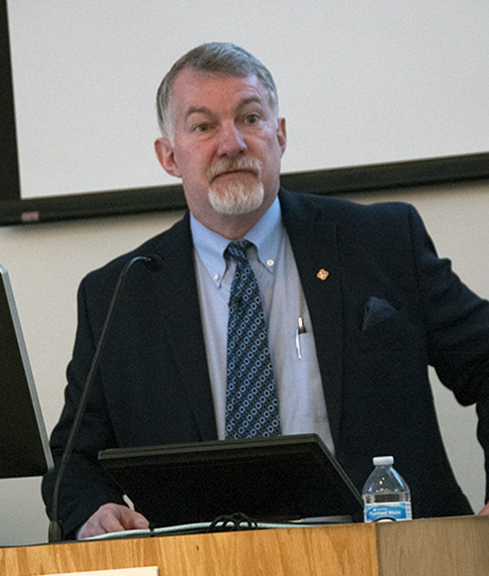 Brian Carter, M.D., an international expert in neonatal intensive care outcomes, medical bioethics and pediatric palliative care presented the 25th annual William T. Sirridge, M.D., Medical Humanities Lecture on March 28 at the School of Medicine. An author of three textbooks on neonatal intensive care and palliative care, Carter shared his observations of how physicians can help parents deal the reality of a young child facing life-altering challenges. He talked about helping them learn to adjust and accommodate the realities of a child’s condition that they can’t change. He said parents and family of children in a NICU typically are fearful and anxious, maybe even desperate as they realize their dreams for their children are being shattered. He said parents go through a process of grasping the situation, trying to understand what decisions need to be made, who can help make them, and understanding all the facts they need to learn. 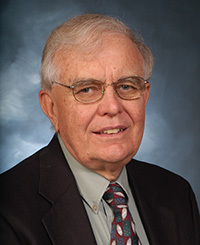 Carter joined the School of Medicine and Children’s Mercy Hospital in 2012 as a Professor of Pediatrics and Bioethics. He serves as co-director of the Children’s Mercy Bioethics Center’s Pediatric Bioethics Certificate Course and practices at Children’s Mercy Hospital as a neonatologist. 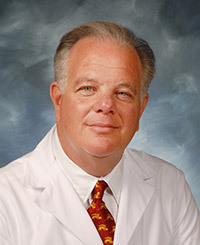 The recipient of numerous NIH grants, he has published extensively in the areas of neonatology, neonatal intensive care, palliative care, and bioethics. He said that while clinicians in the NICU have the benefit of experience and understanding the outcomes of children in intensive care, they need to be cognizant of the needs of parents and families of these children. 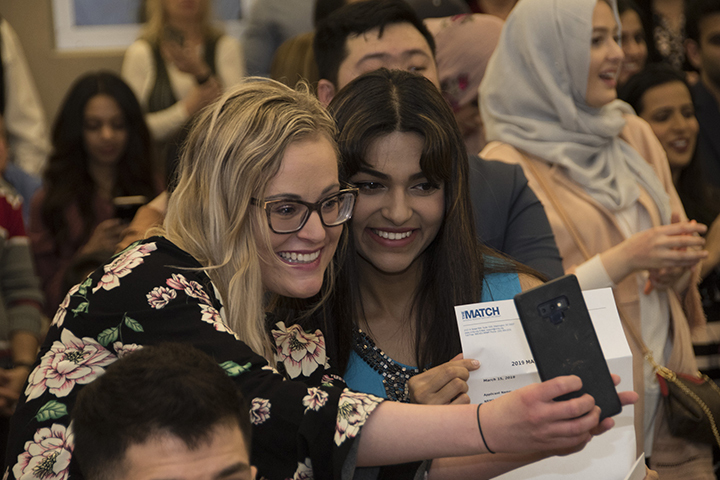 The brisk morning wind couldn’t cool the excitement and enthusiasm of Match Day 2019 at the UMKC School of Medicine. Residencies were announced for 93 students who are headed toward graduation in May. Family and friends cheered them on as they learned where they will write the next chapter in their medical careers. Just more than half of the class will be headed to a primary care residency. Interim dean Mary Anne Jackson, M.D., said this year’s class exceeded the national average of students matching to primary care positions. Many, she added, are headed to notable programs throughout the country. The students won assignments in 28 states and the District of Columbia, from Vermont to Hawaii and California to Florida. Some are headed to the top names in medicine, including Mayo, Stanford, Emory, Baylor, Yale and UCLA. A baker’s dozen will stay at UMKC and its affiliate hospitals; 22 will be elsewhere in Missouri and Kansas. Internal medicine was the top category with two-dozen placements, followed by 14 in pediatrics or medicine-pediatrics, eight in psychiatry, seven each in family medicine and anesthesiology, and six each in emergency medicine and general surgery. Just minutes before 11 a.m., Ryan Lee stood at the back of Theater A surrounded by friends. He was trying to remain calm as everyone waited for the appointed time when students could receive their Match envelopes and discover their residency destinations. “Right now, I’m just feeling relieved because I know I have a job somewhere,” Lee said. Moments later, he learned that he would remain in Kansas City for a preliminary medicine year at the School of Medicine before heading to St. Louis and Barnes-Jewish Hospital for a three-year anesthesiology residency. Meanwhile, Amaka Ofodu was still gasping for breath and accepting a long line of hugs after receiving her first choice of residencies — medicine-pediatrics at Greenville Health System, University of South Carolina, Greenville. Chris Favier held a letter in his hands as his father recorded the moment with a cell phone. His brother, Ben, a 2012 graduate of the UMKC School of Medicine, stood nearby watching with friends and family. A St. Louis native, Favier will be heading closer to home for his first residency choice of emergency medicine at the University of Missouri-Columbia. State Rep. Jon Patterson, M.D., recognized Charles Van Way, M.D., on the floor of the Missouri House. 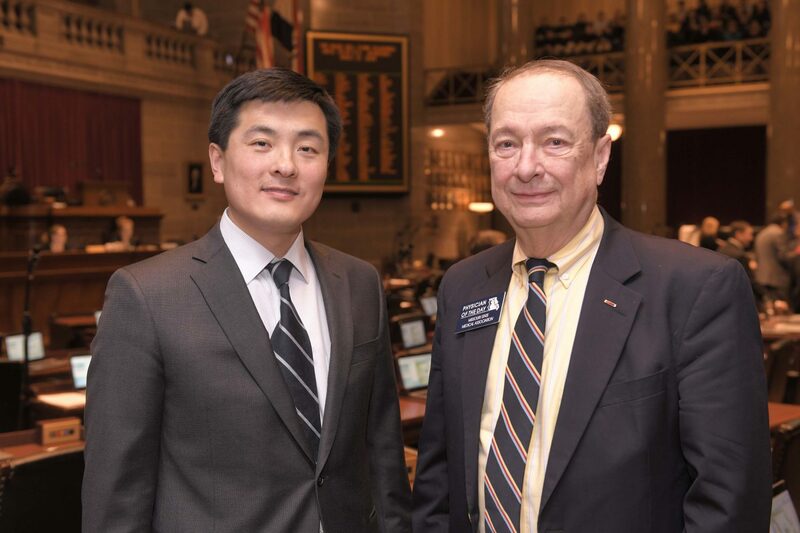 State Rep. Jon Patterson, who completed his general surgery program in 2011 at the UMKC School of Medicine and Truman Medical Center, on Wednesday recognized the former chairman of the TMC surgery department, Dr. Charles Van Way, on the floor of the Missouri House of Representatives. Van Way travelled from his home in Kansas City to serve as the physician of the day at the Missouri State Capitol. Before the start of session, Patterson recognized Van Way’s contributions to medicine and the United States. “Dr. Van Way was a leading surgeon in his field and chair of surgery at Truman Medical Center. I also thank him for his service to our country as he served in the U.S. Army Reserves and is a colonel in the Medical Corps.,” said Patterson, a Lee’s Summit Republican. Winners of the 2019 UMKC Interprofessional Education Health Care Reasoning Competition (front row) Anthony Spalitto, School of Pharmacy; Dylan Schwindt, School of Medicine; Becca Stockhausen, School of Nursing and Health Sciences; Louis Sand, School of Medicine, with School of Medicine Dean Mary Anne Jackson, M.D. (Back row) Event organizers Jordann Dhuse, School of Medicine, Stefanie Ellison, M.D., School of Medicine IPE coordinator, Paig Charboneau, School of Medicine, and Michael Scott, School of Pharmacy. 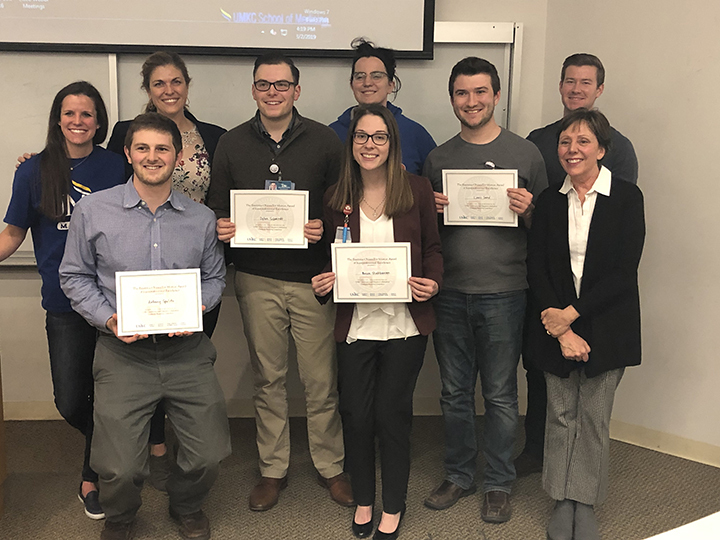 Four teams of students from the UMKC health sciences schools took part in the third-annual UMKC Interprofessional Education (IPE) Healthcare Reasoning competition on March 2 on the health sciences campus. The team of pharmacy student Anthony Spallito, nursing student Becca Stockhausen, and medical students Louis Sand and Dylan Schwind took home the first-place award. The second-place team was made up of pharmacy students Ashley Ragan and Andrew Yates and medical students Diana Jung and Sahaja Atluri. This year’s event had teams manage a patient case in which they had to decide what tests to order, then use the test results to answer clinical questions. The teams were judged on interprofessional teamwork, communication, case progression/problem-solving, diagnosis and treatment. Deans from the UMKC health sciences schools, Russ Melchert, School of Pharmacy, and Mary Anne Jackson, M.D., School of Medicine, served as judges in the final round. Faculty members from the health sciences schools also served as judges throughout the competition. The event is planned each year by a group of UMKC pharmacy and medical students. School of Pharmacy students Michael Scott and Joseph Bredeck, and School of Medicine students Jordann Dhuse and Paige Charboneau planned this year’s event and the patient cases. Organizers work to modify the competition each year to improve the overall experience for students. The group modified this year’s cases and developed Google Classroom as an electronic medical record for students to receive test results and images. At least two different schools were represented on each team in the two-round, case-based competition. Eight medical students, seven pharmacy students, one nursing and one dental student took part in the competition. One team from Washington University in St. Louis withdrew at the last minute because of weather concerns. Ellison said event organizers hope to expand the competition into a local and even a regional event in the future with local teams from outside of UMKC as well as beyond Kansas City. The environment children are brought up in plays a large part in their eventual mental and physical well-being as they get older. 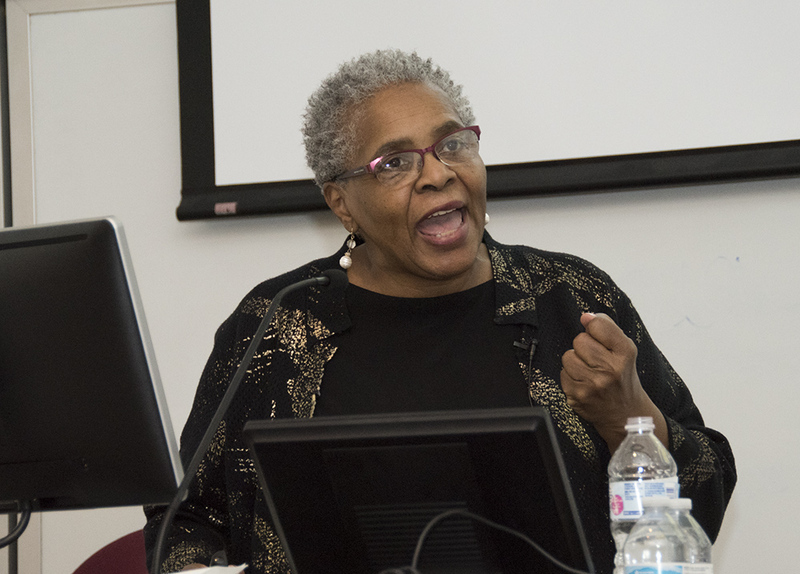 Mental health expert Altha J. Stewart, M.D., president of the American Psychiatric Association, drove home that fact as she gave the annual Dr. Reaner and Mr. Henry Shannon Lecture in Minority Health on Feb. 22 at the UMKC School of Medicine. 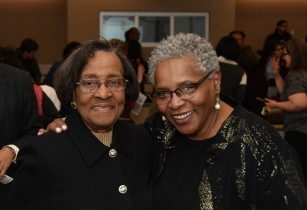 Reaner Shannon, Ph.D., and Dr. Altha Stewart. Stewart spoke of the social determinants of health and health disparities as they relate to children such as childhood trauma, exposure to violence in the community and other adverse childhood experiences. Those events in children’s lives, she said, are things that are driving them into the juvenile justice or child welfare systems. Stewart supported her statement with statistics that showed 70 percent of children entering juvenile justice our child welfare have experienced one episode of a traumatic event that has impacted their psychological development, physical health and ability to relate to others in a socially appropriate way. She added that 30 percent of those children have a history of physical or sexual abuse and have some diagnosed learning disability. Stewart has spent decades as chief executive officer and executive director of large public mental health systems in Pennsylvania, New York and Michigan. She currently serves at the University of Tennessee Health Science Center as associate professor and chief of social and community psychiatry. She is also director of the school’s Center for Health in Justice Involved Youth. Before going to the University of Tennessee, Stewart was the executive director of a federally funded system of care program in Memphis for children with serious emotional disorders and their families. An experienced health care administrator and nationally recognized expert in public sector and minority issues in mental health care, Stewart also worked as executive director of the National Leadership Council on African-American Behavioral Health. She said that the current health care system is filled with disparities and a lack of cultural awareness. Unequal treatment, she added, points to glaring disparities that must be addressed ranging from differences in language to different understandings of illness and wellness. “Health care is a right, not a privilege. Unless we do some of those things, we will not address the needs of man people in the population,” Stewart said. The Shannon Lectureship takes place each February to create awareness about health disparities. It has welcomed such distinguished national speakers as former U.S. Surgeon General Jocelyn Elders and former U.S. Secretary of Health and Human Services Louis Sullivan, as well as noted local leaders in minority health. Long-time UMKC School of Medicine faculty member and docent Lynn DeMarco, died on Feb. 15 in Leawood, Kansas. He was 85. Dr. DeMarco joined the School of Medicine and the internal medicine staff at Truman Medical Center in 1977. He served as a docent for 10 years and continued on the School of Medicine faculty as a professor of medicine. Interim Dean Mary Anne Jackson, M.D., was a member of Dr. DeMarco’s docent unit as a student at the School of Medicine. Jim Wooten, Pharm.D., said he remembered how years ago Dr. DeMarco helped him fit in as a new member of the School of Medicine faculty. Before coming to Kansas City, he was in private practice at the Donahoe Clinic, later Central Plains Clinic in Sioux Falls, South Dakota. A graduate of Creighton University and the Creighton University School of Medicine, Dr. DeMarco interned at Harbor General Hospital in Torrance, California. He completed his internal medicine residency at the Mayo Graduate School of Medicine in Rochester, Minnesota. He is survived by his wife, Mary Dianne Markell DeMarco, daughters, Gini Collins, Theresa DeMarco, Paula (Fritz) Long, Sons, Romano (Melissa), Lynn (Nick), John (Erika) and 10 Grandchildren, Virginia, Laura, John, Dianne, and Maria Collins, Henry, Walter, and Veronica Long, Oscar and Andrew. 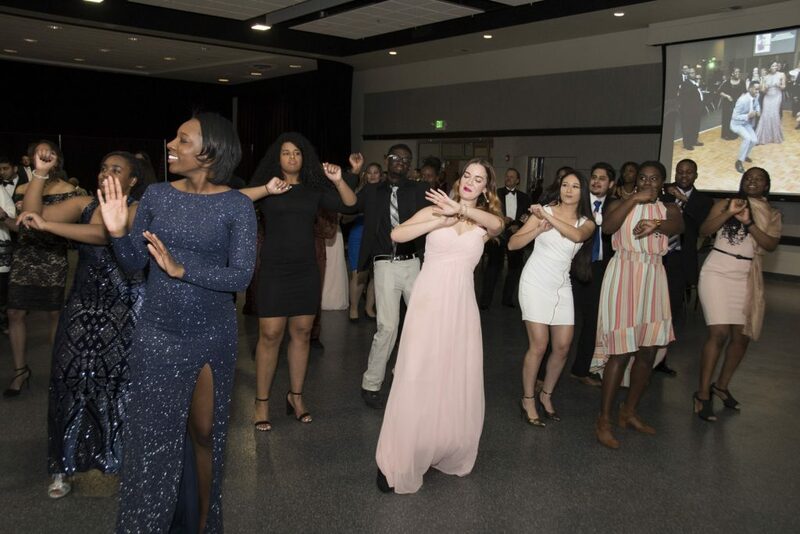 Music and a festive atmosphere filled Pierson Auditorium in the UMKC Atterbruy Student Success Center on Saturday night, Feb. 16, when nearly 200 people enjoyed the fifth annual UMKC Health Sciences Harmony Gala. The event is sponsored by the UMKC Health Sciences Diversity and Inclusion Council. It serves as a scholarship fundraiser to support underrepresented minority students enrolled in the UMKC health sciences schools of Dentistry, Medicine, Nursing and Health Studies, and Pharmacy. In addition to dinner and dancing, the event included a presentation of the 2019 Health Care Provider Diversity Awards. This year’s awards were presented to Children’s Mercy, the Sojourner Health Clinic, Saint Luke’s Health System and Truman Medical Centers. The award acknowledges and honors health care professionals of diverse racial and ethnic backgrounds for their outstanding commitment to provide health care to underserved populations in the Kansas City metro area. 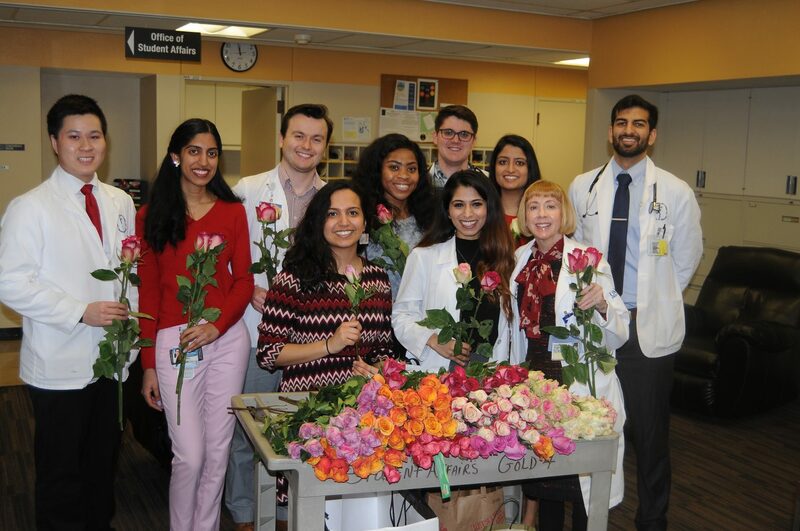 Members of the School of Medicine’s Gold Humanism Honor Society delivered roses and Valentine’s Day cards to patients at Truman Medical Center. See more photos on our Facebook page. A Valentine’s Day visit from a group of nearly a dozen UMKC School of Medicine students brought smiles, and often tears, to patients at Truman Medical Center on Thursday, Feb. 14. The fifth and sixth-year medical students are members of the school’s Gold Humanism Honor Society (GHHS). They and their faculty advisor, Carol Stanford, M.D., professor of medicine a School of Medicine docent, spent a portion of their morning presenting roses and Valentine’s cards to throughout the hospital. “This is one of the few times of the year where we stop what we’re doing and just take some time to appreciate the patients,” said sixth-year med student Ami Purohit, a member of the GHHS. For a number of years now, Stanford and her honor society students have delivered roses and cards to patients on Valentine’s Day as part of the GHHS Solidarity Week for Compassionate Patient Care. Deven Bhatia, president of UMKC’s GHHS chapter, said the organization purchased 250 roses. Earlier in the week, the students invited others throughout the med school to join them in creating more than 200 hand-made Valentine’s cards. This was Purohit’s second year to join Stanford and her GHHS classmates on their Valentine’s Day rounds. She said she found the experience rewarding. Last year, the School of Medicine received the Gold Humanism Honor Society’s Distinguished Chapter of the Year award. The honor recognizes the chapter’s impact, leadership, service activities and humanistic learning environment. Stanford said the chapter received the award for its program excellence, which included a national “Thank A Resident Day” that started just two years ago at UMKC. The GHHS has 150 chapters in medical schools and nearly a dozen residency programs throughout the United States.